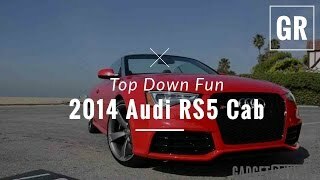 The 2014 Audi RS5 Cabriolet entices with a scintillating combination of power and elegance. The Audi RS5 Cabriolet features the very latest version of the quattro drivetrain - with the self-locking crown-gear center differential and torque vectoring. The Audi RS5 Cabriolet is available in eight exterior paint finishes. It is powered by the 4.2 FSI which combines high torque with spontaneous response and dynamic high-revving flexibility. The naturally aspirated V8 produces 430 Nm (317.15 lb-ft) of torque from 4,000 to 6,000 rpm. At 8,250 rpm, it develops 331 kW (450 hp) from 4,163 cc of displacement; the high-revving fun is not electronically limited until 8,500 rpm. The long-stroke naturally aspirated engine develops 79.5 kW (108.1 hp) per liter displacement and special flaps in the exhaust tailpipe vary the sound. The convertible accelerates from a standstill to 100 km/h (62.14 mph) in 4.9 seconds - the best in its class. As an option, Audi can increase the top speed from 250 (155.34 mph) to 280 km/h (173.98 mph). The combined fuel consumption of the powerful V8 is 10.7 liters per 100 km (21.98 US mpg). The Audi RS5 Cabriolet will go on sale to customers in Germany in early 2013, with a base price of 88,500 euros.